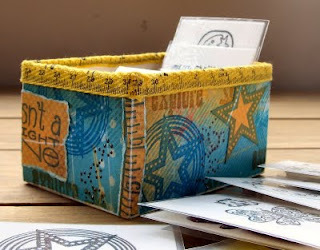 I made this little storage box using instructions from this month's Craft Stamper (Sept 09). Many thanks to Joanne Wardle for sending them in! 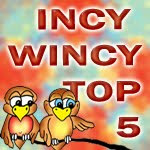 You've got to take a look at her blog, not only is her work gorgeous but she's multi-skilled too, I'm very jealous, lol! "Cut lots of 2"x2.5" white card. Stamp Images & laminate & store the stamps on the back of these. To make the box, cut a rectangle of card 6.5"x7.5", score along each side at the A6 gatefold line of any standard scoring board (or 2" in from side), cut along the scoring lines of the long edges, fold up to make box and glue flaps in position. 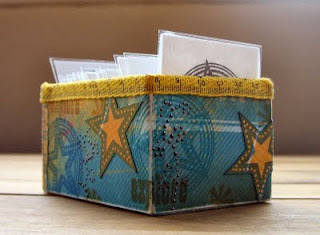 Cut a 2" strip from a 12x12" piece of decorative paper, decorate with stamped images and glue around box. Finish the top of the box with ribbon, affixed with glue or double-sided tape, to cover untidy edges"
Now I found with my box that a 12" strip did not quite go round, I suspect it may be my measuring at fault but I'm just wondering whether shaving a couple of mil off each side might rectify the problem...? Hi, Nikki, thank you for your comment on my blog. Yes, it's my box that's in craft stamper, and I am so glad that you like it. I love what you did with yours. And although you don't have to, it would be nice to be credited :) thanks for thinking of it. Hi again, I've linked your piece to my blog.